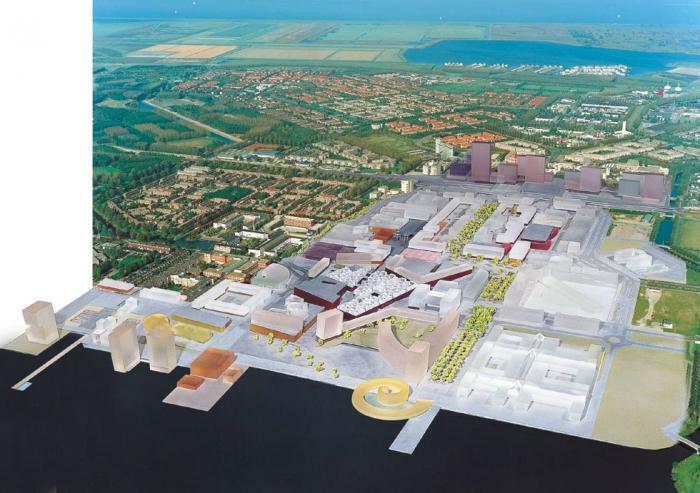 1999 - 2007 Development of the new city centre in the heart of the polynuclear city of Almere. The city is located in the southern part of the province of Flevoland, on the northern edge of the western conurbation or 'Randstad'. A Master Plan has been drawn up on behalf of the municipality by the Office for Metropolitan Architecture (OMA) consultancy. A number of market players are participating in the development. Construction is actively underway. A little over 30 years ago the heart of the Netherlands was still under water. Fishermen hauled in their nets where a little later, in 1968, Zuidelijk Flevoland has been reclaimed. The reclaimed land provided space for the construction of a new town, Almere, to relieve population pressures in Amsterdam and Utrecht. But that was not all: it was also required to develop its own economy with a sufficient number of jobs to minimise the need for commuting. Building a city for 300,000 inhabitants in a short space of time is a massive undertaking. 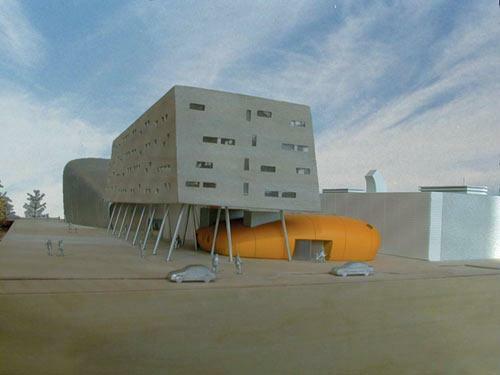 A polynuclear design was decided upon to enable the city to respond to the fullest possible range of social developments. This means that Almere consists of a number of urban districts each built in its own period according to the insights and experience at that time. The resultant differences in character are further enhanced by the broad green zones separating the urban districts. Apart from the road system an extensive network of bus lanes and cycle paths provide the necessary transport links. At present Almere has a population of 150,000 and is working on the completion of the first three urban cores with Almere Stad as the central and main element. A start has also been made on the next core. Almere is close to two of the largest urban regions in the Netherlands, Amsterdam and Utrecht, with a direct and rapid rail link with Amsterdam and Schiphol. In addition there are a number of high quality natural features in the immediate environs: a "wetland area", lakes, woodlands and the open spaces of the polder landscape. In 2010, the construction of Almere will have reached the outer limits of the current structure plan. The potential need for expansion in the surrounding regions is expected to remain so high that Almere will continue to grow rapidly in the future. The municipality is now developing an urbanisation strategy in a regional context. If the growth continues at the present rate of 3,000 homes a year, Almere will be the fifth biggest city in the country in 10 years' time. Urban expansion on this scale would mark the transition from a medium-sized to a large city by Dutch standards. Such a "quantum leap" necessarily calls for a wider package of metropolitan facilities. Apart from the expansion and strengthening of the existing facilities, totally new activities appropriate for a city of 300,000 inhabitants are therefore required. Against this background it is important for the city centre to be equipped with the full range of services and amenities. In order to achieve that goal, the municipal executive has made special arrangements to supervise the quality of development. An ambitious plan by Rem Koolhaas's Office for Metropolitan Architecture is in the process of implementation for the next stage. New towns such as Almere can have a strong identity too. For a long time, Almere had a negative public image as a suburban low-rise dormitory town populated solely by small families where there was nothing to do. At the same time the residents of Almere were often very positive about their town, praised the quality of life (space, peace and quiet, greenery) and developed a strong sense of shared identity as they pioneered the new town. Nowadays it is the special features of Almere new town that are increasingly emphasised: a place where new developments have the opportunity to flourish. 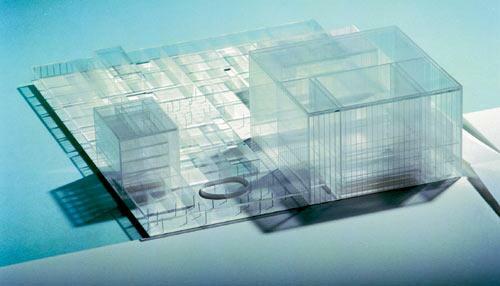 The Master Plan drawn up by Rem Koolhaas fits in with this picture. The development of the city centre is the crowning development in the emergence of a polynuclear, suburban dormitory town - Almere as a city in its own right. The identity of the city will be enhanced as soon as it has a beating heart of its own where the local residents can go out and meet one another and which provides an orientation point on their mental map. The Master Plan also marks a break from the much-maligned suburban uniformity. The city is emerging as an architectural landmark and beacon of special quality, and hence a source of urban self-assurance. In addition the scale and daring of the plan strengthen the identity of this new, organic city. As it stands, Rem Koolhaas's Master Plan still concentrates unilaterally on the heart of the city as a recreational and shopping centre. A truly classical city centre, however, also requires public services and amenities if it is to be perceived by the inhabitants as a genuine community centre. This means higher education facilities, a court and a town hall. And the city must be inhabited by a sizeable and heterogeneous population: starters and the well-off, students and pensioners, people of traditional Dutch origin and ethnic minorities. The new identity of Almere, of which the development of the city centre is just the start, builds on the old features of its identity and characteristics of the present population. It is a "new" town, a "spacious" town. 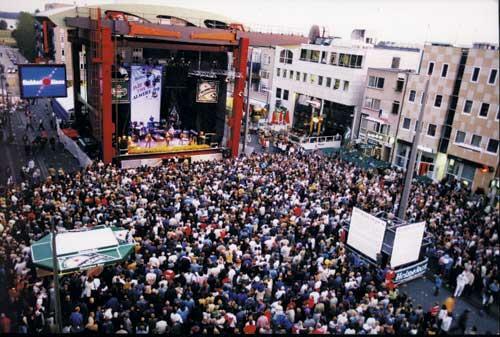 It is a city of recreational amenities, not just with its theatre and museum, but also with events, popular and lowbrow culture, and space for the new and the experimental. This is why the city centre has been planned in recognition of the importance of all these cultural manifestations, also to provide a meeting place for them, where facilities for young people, students and budding artists are not treated as a residual category. The Weerwater lake has been developed into a site for events. Halfway through the last century, large polders were established in what had formerly been a large inland lake in the Netherlands. Over 25 years ago, a start was made on the construction of a polynuclear city in the southernmost part. At the end of 2000 it already had a population of 150,000. 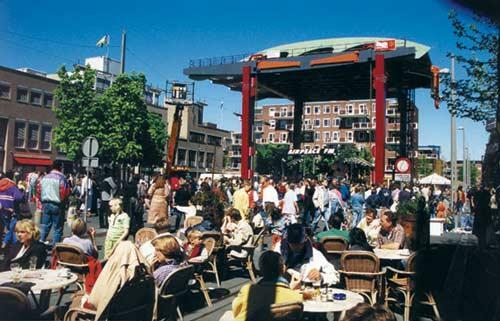 With an annual growth of 6,000, the latest administrative surveys suggest that the city will eventually reach a population of over 300,000, making it the fifth biggest city in the Netherlands. The central core - Almere Stad - borders a recreational lake. The size of this existing centre with its shopping and recreational facilities was geared to a much smaller population. The planning of the centre did, however, take account of future growth and space was set aside on the edge of the central lake beside the existing centre. It is here that the new heart of the city of Almere is being built. The heart of the city, including the business centre, will turn Almere into a complete city for living, working and recreation. Since the success of a city centre depends on the existence of a full range of diversified facilities, a multiplicity of functions in close proximity to one another is being planned for Almere. A Master Plan drawn up by the architect Rem Koolhaas and his Office for Metropolitan Architecture (OMA) is being used for a sloping ground level development. At "ordinary" ground level there is space for traffic, parking and, dispersed covered city centre facilities and amenities. On top of this is a second, curved ground level area is to be constructed with a gentle slope rising to a height of six metres. With shopping streets, squares and an attractive public area, this will be a pedestrian domain. All this borders the central Weerwater lake, thereby creating an attractive waterfront. On the northern edge the centre will be bounded by the central station, together with the business centre and World Trade Center building. The city centre will contain around 2,400 dwellings (of which 1,000 new), most of them high-rise luxury apartments. Underground there will be 6,500 parking spaces (4,300 new), a dedicated bus lane with stops and a city centre ring road to provide access. The amount of shopping space will be increased by 50,000 m2 to 85,000 m2. The new business centre alongside the central station will also have a 120-metre tower. This will provide 170,000 m2 of floorspace, in addition to the existing 40,000 m2. A total of 1,400 parking spaces will be provided underneath the offices. The city centre of Almere must meet the existing demand and anticipate future demand. The city is a living organism and must continue to operate in the midst of largescale construction activities and infrastructure changes. The city centre is a complex whole. Urban development design, architecture, public spaces and functions are being carefully harmonised with one another. The Master Plan provides a strong basis for this. The municipality, investors, developers and interest groups are working together. The municipality has set up an energetic and flexible organisation, namely the City Centre Development Corporation (Dienst Stadscentrum). Urban development experts, planners, project leaders and managers on this body direct and oversee the development work. Also a special team has been appointed to oversee quality and assist it in implementing the project. The Q-team consists of Maarten Schmitt, Arnold Reijndorp, Michael van Gessel, Tania Conko and Rem Koolhaas. • The existing city centre is being thoroughly revitalised. Access roads are being greatly improved or totally renewed. The public spaces are being laid out anew and refurbished. 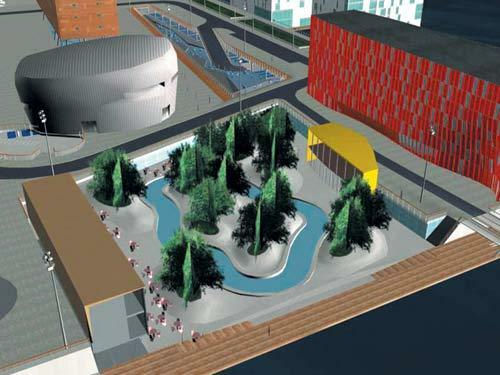 A Public Spaces Scenario has been drawn up for this purpose, making allowances for the future link with the new city centre. • The business centre is actively being developed. Three elements are under construction: east, west and central. A start was made on the eastern part in 1998. A number of buildings in the eastern part have already been commissioned. At the centre will be the 120-metre high World Trade Center. The handover is scheduled for 2004. The Business Centre will be completed in 2007. • The city centre for living, working and recreation is being developed in three stages. The oldest part was the first to be started. The Weerwater recreational area will be completed in 2003. Three striking city centre residential developments are to be built beside the Weerwater in the form of high towers marking the edge between the city, green space and water. Offices and shops will also be constructed during this stage. The handover is planned for between 2001 and 2003. The large shopping heart that is to follow will be constructed between 2003 and 2006.